Today is the last day for the Classic Wedding Collection. Next week we launch a brand new beautiful collection...I'm sure you've seen the sneak peek! Tomorrow, my hubby and I will be celebrating our 54th Wedding Anniversary! Other Products: Pearl White Metallic Cardstock, white cardstock, Brilliance Pearlescent Ivy Ink Pad, VersaMark, Silver Embossing Powder, heat gun, Distress Clear Rock Candy Crackle Paint, Misti, Big Shot, paint brush, hot glue gun, dimensional foam tape. Instructions: Create a 6” x 6” card base with the Pearl White Metallic cardstock. Cut two mat layers from the paper pad 5 3/4” x 5 3/4” and 5 7/8” x 5 7/8”, ink the edges and adhere to the card base. Cut another panel and adhere to the inside of the card. Die cut the Medallion. 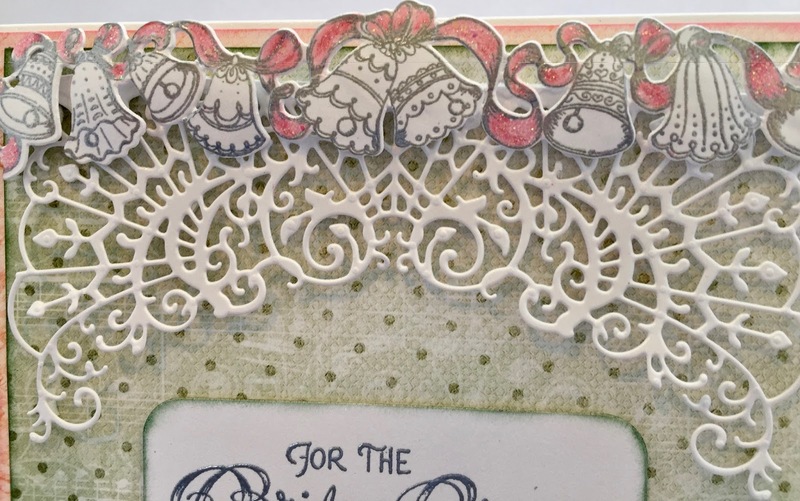 Stamp the sentiment and the wedding bells border with VersaMark and heat emboss using silver embossing powder. 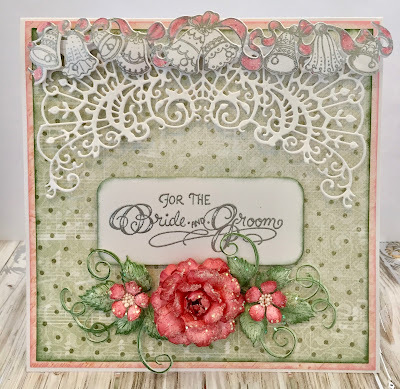 Cut the wedding bells with the matching die and use the Stack and Store Daubers with the Poppy and Coral inks to color the ribbon. Add glitter. Cut the sentiment with the Cut Mat Create die and ink the edges and adhere to the card as shown with dimensional foam tape. 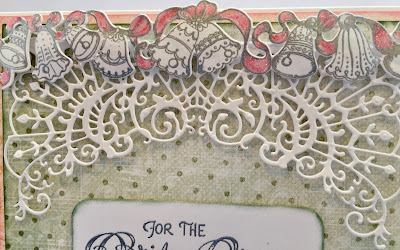 Adhere the medallion and the wedding bells border to the top of the card using Darice Adhesive Foam Strips. 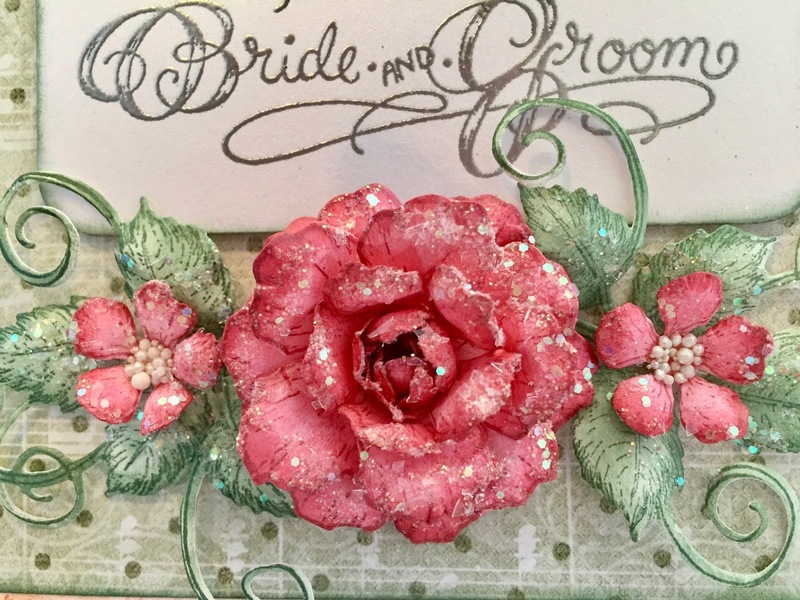 Stamp the roses on white cardstock with Pearlescent Poppy Ink, color with Pearlescent Coral and highlight with Pearlescent Poppy. Die cut with the matching die and shape using the Deluxe Flower Shaping Kit. 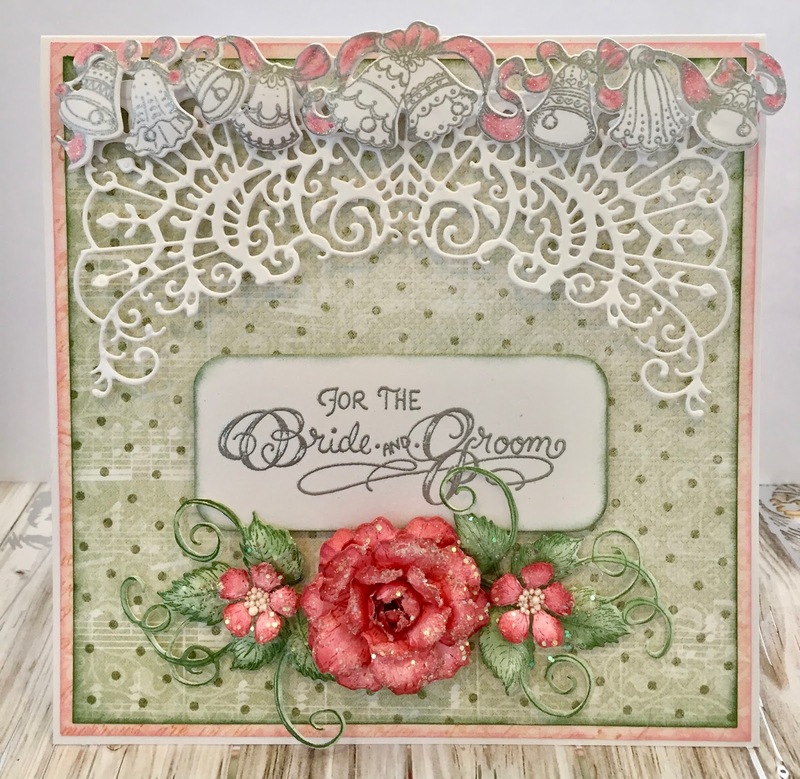 Stamp and color the rose vines with Pearlescent Ivy ink, die cut with the matching die and shape using the Deluxe Flower Shaping Kit. Paint the roses and vines with Distress Crackle paint and glitter with Rajni Chawla’s Crystal Clear. When they’re dry adhere to the card using a hot glue gun. Thank you again for stopping by...leave a comment if you can. This is just gorgeous! I love the border! 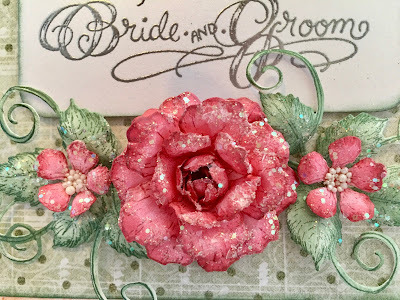 This is gorgeous - love the border and the roses! What a gorgeous card!!! Have a great weekend! Loving your flowers! Very pretty card! The fold out cards are always my favorite! Beautiful cards! hahaha!!! i am in love with this website. beautifully done cards, flowers and lace borders specially take my breath away. flowers out of papers done so beautifully never seen before. Thanks jan.